Langtang valley trek is less demanding but outstanding trail lies north central of Nepal, almost 6 hours drive north direction to Kerung boarder to Tibet from Kathmandu valley. Langtang valley trek is inhabited by Tamangs and local sherpa, who share a similar religion, language and clothing style. The landscapes we cross are extremely varied; fertile land terraces, rhododendron with pine forest, and in the highest parts, a rock and shrub wilderness with the fascinating backdrop of snow covered mountains. Langtang valley trek in Nepal offers great Mountain scenery from Tserkuri hill 5,120 meters. 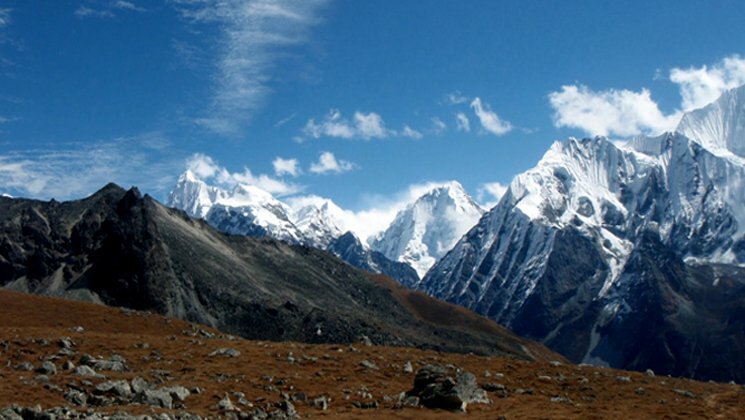 Langtang valley trekking unites the distant and spectacular view with great Himalayan Panorama. Return to Langtang trek is simply about eight days itinerary which is easy hiking throughout the beautiful nature combine with peaceful culture. Hike to Langtang valley trek offers comfortable accommodation with delicious cuisines run by the local inhabitants where you can touch the local hospitality. Not only this but also you can experience in Langtang trek as off the beaten Paph trail, Low-risk factors, financially cheaper, unspoiled culture and natural biodiversity, beautiful mountain scenery, Buddhist Monasteries…etc. Langtang valley trek offers modern lodges with nice camp sites, the pristine Himalayas with the view of giant Ganesh Himal family. Langtang Valley lies closer to the north of Kathmandu valley, offers beautiful mountains, typical villages, Mixed and diverse in cultures, can be access by overland drive, glaciers and glacial lakes here Mountains rise soaring toward the sky. Langtang valley trek or return to langtang is suitable for any walker looking for something a little bit challenging routes but it does not require you to be super ft or have any previous trekking / mountaineering experience. If you are healthy and can walk 5 to 6 hours daily, you can do this trekking. However, daily jugging or walking exercise is useful before you depart. Our program always include rest days and build up gradually, in order to acclimatize to the altitude. On trek, you can go at your own pace, with plenty of stops for resting. Kathmandu – Dhunche Bazaar – Lama Hotel – Langtang village – Kyanjin Gompa – Tserkuri hill station. Day 09: Trek to Dhunche Bazzar. Trek finish , Evening celebration ! Upon your arrival at the Tribhuvan international airport our representative welcomes you and assists to transfer in your hotel in Kathmandu. After time to get refreshed, and briefing about your langtang valley trek and overnight at Hotel. All aspects of gear and conditions are discussed to make sure you’re fully prepared for the trip, and any last minute questions answered. Around 10 AM, you can start your sightseeing journey with our professional private tour guide. Today, we explore this medieval capital city Kathmandu and its world heritage sites. We visit Boudhanath, also known as Little Tibet. Then we visit Pashupatinath, holy temple of Hindu where cremation takes place by the holy river Bagmati. Later we visit Patan Durbar Square, Kathmandu Durbar Square, and Syambhunath Stupa. At evening, briefing about the Langtang valley trekking. This morning we’ll drive on a northern highway that twists and climbs over mountain ridges to the Trishuli valley for lunch and on to Sybru village for the overnight. The journey will take 8 hours through picturesque landscapes, mountain scenery, and local villages. From Syabru we’ll have magnificent views of mount Ganesh Himal, mount Manaslu and mount Kerung of Tibet. Stay overnight at lodge. After breakfast we start to walk own our pace and the trail ascends for around two hours through the forest followed by a climb of about an hour to reach Bamboo village (1,850m) where we’ll stop for lunch. This forested path follows the upstream and can be seen birds life around the bushes. Beehives hanging on a cliff are another attraction for the visitors. From here we’ll again steeply climb through the bamboo forest to reach the Lama Hotel, overnight stay in lodge. Today we’ll have a pleasant walk and follow the trail through rhododendron and pine forest for around three hours to reach Ghora Tabela where we’ll stop for lunch. This surrounding area dense wild habitat area and many small babblers with a lot of herbals can be found here. After lunch we’ll walk another three hours on the scenic trail takes us to Langtang village where we’ll relax for the evening, overnight stay in lodge. After breakfast this morning we’ll leave the village and start our trek leisurely for around three to four hours to visit Kyanjing Gompa. From here we’ll also have beautiful views of Mt Ganchempo and Langtang Lirung. We’ll visit the surrounding area like Yak cheese Factory, Monastery and local houses as we relax for the evening at Guest House. This morning we’ll retrace our steps somewhat as we head back from the Gompa. We have an easy downhill and pleasant walk through the rhododendron forest to Lama Hotel where we’ll rest for the night before continuing our journey tomorrow for the Thulo Syabru village. Today our trail leads again through bamboo & rhododendron forest where we may see the local wild boar as well as other animal and bird life on the route to Thulo Syabru. During the route we’ll have marvelous views of Mt Ganesh Himal, so close it seems like it’s beside us. Firstly easy downhill follows the river bank but last part steeply uphill for a couple of hours to get to the village. This morning after breakfast we’ll be ready for trek onward to Dhunche. This is quite a pleasant walk through the forested path and some old Tamang village’s takes to get 4-5 hrs. After arrival in Dhunche, rest of the time explores the town which is headquarters of Rasuwa district. This will be your last night with your trekking crew except for trekking Guide. Trekking crew will organize a farewell ceremony, Nepali song and dance, staff members will be allowed to drink to join the party. You may want to try a local drink called “Rakshi”, please be aware; it does not taste good and is very strong. Today we’ll have an early morning drive to Kathmandu. It will take roughly eight hours. We’ll reach Kathmandu late afternoon then enjoy our night at Thamel. Upon arrival, any hired gears will be collected and your international flight tickets will be distributed. How much does Langtang valley trek cost? About Langtang valley trek or Return Langtang valley with its panorama trekking price will vary according to group size you are coming with. Taking a private jeep from Kathmandu to Syabrubensi or from Dunche Bazaar to Kathmandu saves your time and riding local bus reduces the trip expenses. For the deluxe and luxury trek plan, we add Kathmandu – Syabrubensi and Dunche – Kathmandu round trip by private 4 x Jeep, 3-star category hotel deluxe air-conditioned room in Kathmandu (BB PLAN) with attached bathroom while on trekking on possible places, so let us know. AND WE ARE OPEN TO CUSTOMIZE YOUR TOUR AND PACKAGES PRICE AS PER YOUR REQUIREMENTS. International tour leaders are highly encouraged to get discount and attractive complimentary. Meals on full board plan: Breakfast, Lunch and Dinner each day during the trek in the mountains. Local Bus transfer from Kathmandu to Syabrubensi and return to Kathmandu for guest and guide. Your hotel in Kathmandu to Buspark and from Buspark to your hotel transfer by private taxi. We can organize private langtang valley trek starting at any date that works for you. Please contact us for more information. Answer: Yes sure !! If you provide us your flight’s details then you should do request then our representative will come to pick up you on Kathmandu international airport. Question: Do I need experience for Langtang valley budget Trek? Answer: This trekking is suitable for keen trekkers/walkers who are able to walk around 5 – 6 hours a day, with a lightweight rucksack. For Langtang trekking or Langtang valley trekking – yes, you need to have experience of walking 5- 6 hours a day in high altitude – somehow about 3000M above sea level. Question: What kind of accommodation can I expect on standard Langtang valley Trek? Answer: We provide you hotel accommodation in Kathmandu and during the trekking there would be clean and private accommodation (double bed room) which offers a nice mattress and blanket. We can also offer you sleeping bags if needed (which need to return after the trip) but it is always better idea to own sleeping bags. Question: What kind of food can I expect in Langtang valley Trek? Answer: All the guest houses/lodges in the trekking they have attached restaurant and they cook a delicious range of mostly vegetarian such as Pasta, tuna bakes, noodles, potatoes, eggs, dhal bhat, bread, soups, fresh vegetables (variety depends on the season). Question: What opportunities will I have for shower along Langtang valley express Trekking? Answer: Guesthouses along the routes they have a shower which you can get it for free and in Camping trekking – we provide you hot water bucket then you will take a bucket shower. Question: How do I get drinking water on Langtang valley express Trek? Answer: During the trekking route there are all places hotel and shops where you can able to buy mineral water and you can buy it for drinking but however we advise against buying mineral water in plastic bottles, as currently there are no provisions for disposing of these. Instead, we provide you boiled water or bringing chlorine tablets to purify the normal water as the normal water is available in camp site/along the way in the camping trekking. Answer: During the lodge trekking there will be chances to charge your battery. We recommend you bring an extra pair for in case. Remember to bring your own adapters! Question: Is there any communication facilities on Langtang valley Trekking? Question: Who will carry my luggage on Langtang valley Trekking? Question: Is there any communication while we are on Langtang valley Trekking? Answer: There are telephones service in some villages along the popular trekking routes from which you can make international calls. Answer: When walking/trekking in the mountains, the distance you cover each day can vary greatly due to a gradient, terrain, and altitude. As such it is very hard to give specific distances on each day, however, you have to be prepared to walk for 5-6 hours each day. Question: Do I need walking polls for Langtang valley Trekking? Answer: You can allocate US$ 08 – 10 for a lunch/dinner in Kathmandu and it depends on your spending habits. US$7 to 10 US$ a day will be enough to buy bottles of water, chocolates, tea coffee and some drinks for trekking. The above itineraries are subject to change due to the condition beyond out of our control. This is a Guideline showing tentative camp night stops. If these itineraries, are not suitable for your target time and designation, just write us so then we will design the best itinerary on request. The physical, technical and natural condition may change this above itinerary.